Springmoor welcomed Heather Cross, Read and Feed’s Volunteer Coordinator, this week. Her presentation was inspiring! The need for reading assistance in Wake County is great. Our auditorium was filled with retired School Teachers, Principals, Professors and other professionals all eager to find out more about volunteering. On Thursday, September 8, we will travel to the Cary offices to help assemble 600 tote bags to begin this year’s program. One group of Springmoor volunteers will help with the morning shift and another will follow in the afternoon. 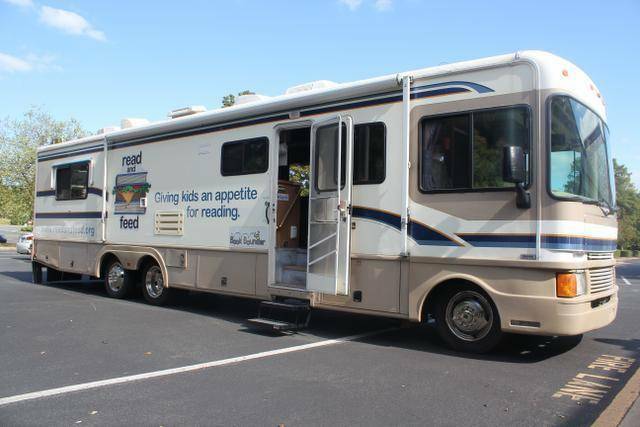 Together, they begin our first partnership with Read and Feed. 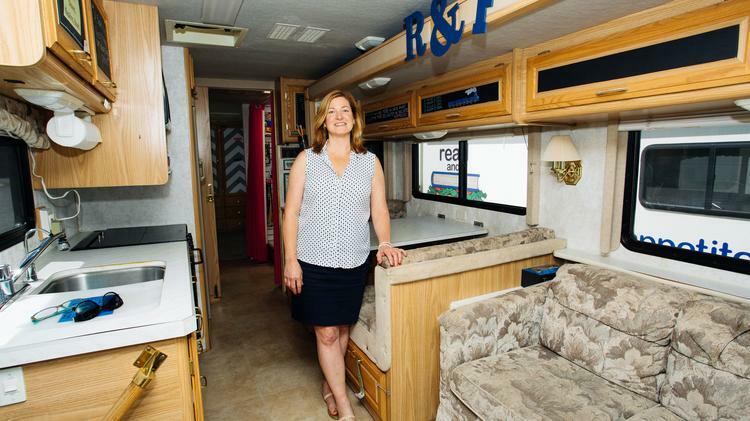 In October of 2007, Jan Frantz, Read and Feed’s founder, quit her corporate job, purchased an RV and drove it to Penny Road Elementary in Cary. As a volunteer tutor at Northwood Elementary, she began to see that every child’s opportunities are not the same. Struggling to read on an empty stomach is difficult. 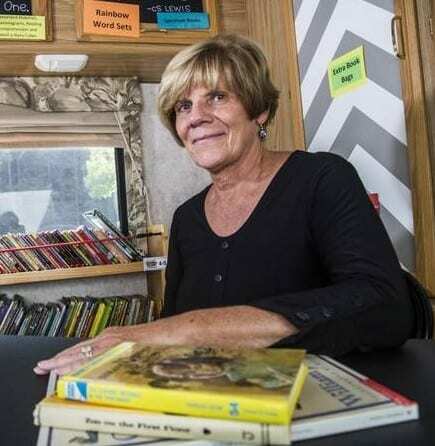 Having no reading resources at home adds to the problem facing many of Wake County’s lower income students. Jan spent many months researching the issues these children face. She found that seventy-four percent of children not reading on grade level by the third grade would find it impossible to ever catch up. As the subjects get more complex, reading becomes more and more important. If a child can’t read, their struggles begin. Confidence is lost, grades are low and bad behavior can start. Providing a nurturing environment as well as a warm meal makes learning so much easier. Each child in the program spends a little more than an hour with a volunteer each week. Eating, reading, listening, and spelling vocabulary words fill their hour. The program comes to the areas where the children are in the greatest need. The RV is driven to sites close to their homes. Two groups are served each night in local community centers or in the Read and Feed RV. The child is given three books each night to take home with them. Jan has since partnered with the Interfaith Food Shuttle to provide warm meals. Food is also donated or purchased at a discount from local restaurants. 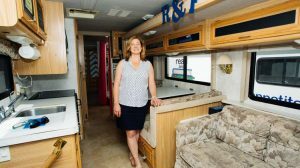 She has found volunteers across the county and continues fund-raising events so that the program can bring all of our children up to grade level. Springmoor is excited to participate this month with the assembly of the children’s tote bags. The bags will be filled with books, crayons, paper and other school supplies. The volunteers that came to our first meeting were motivated to find other ways that they can help with this exciting project – donating books, serving meals in the summer months, providing financial support, or tutoring. The possibilities to help with Read and Feed are being talked about in groups across the campus. In October, we will be participating in our 6th Annual Stop Hunger Now program. Assembling more than last year’s 50,000 meals will be our 2016 goal. We hope to develop as great a partnership with Read and Feed as we have with Stop Hunger Now. Volunteering in the community is a very important activity to everyone here at Springmoor. ← Time for a Walk?